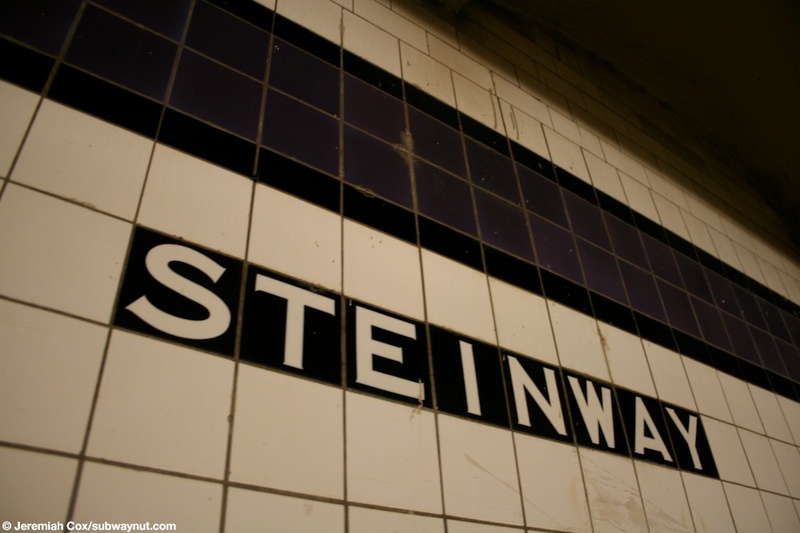 Steinway Street is a local stop on the Queens Blvd Line. 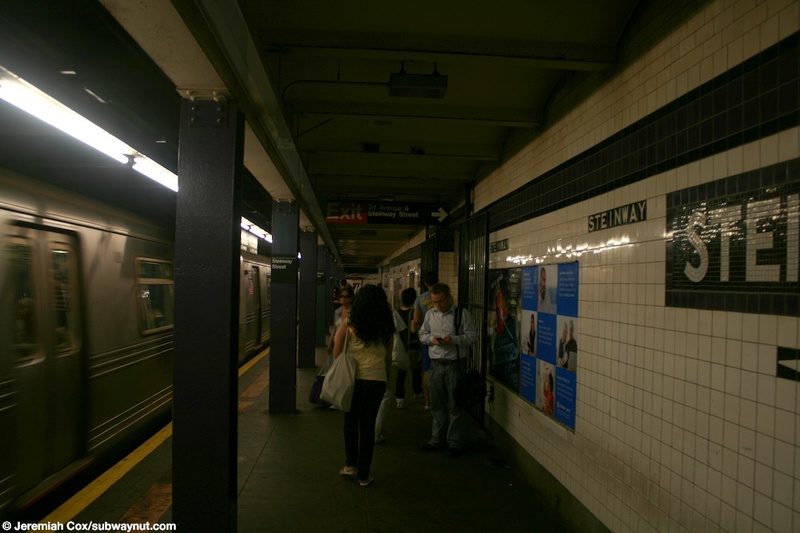 The station has two side platforms on the two-track line because the Express tracks have left the local ones to take a more direct route via Northern Blvd to Queens Plaza. 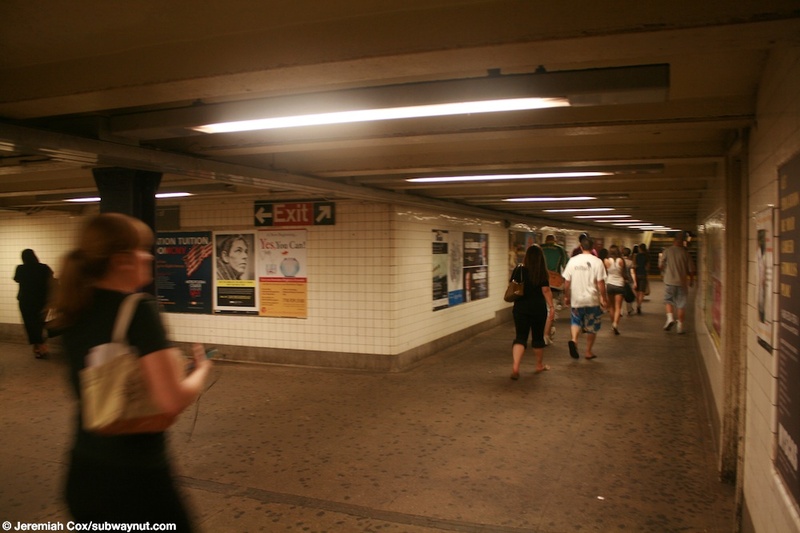 The station itself has two exits each on there own small mezzanine areas that both provide free crossovers that are completely separate from each other. 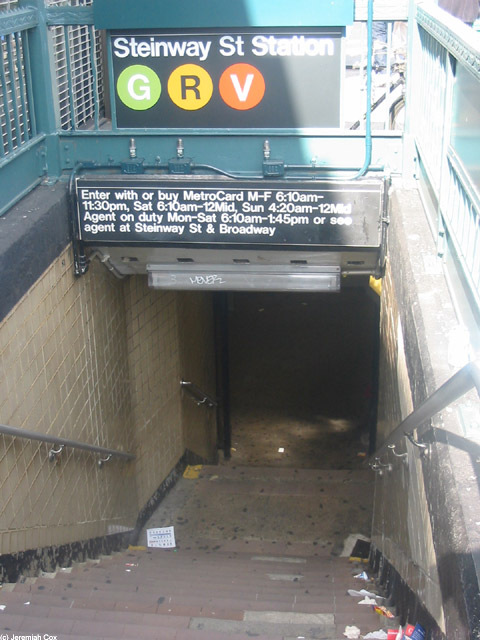 At the center of the station's platforms single staircases lead up to a narrow mezzanine that has turnstiles in the middle of it. These are only open part time. 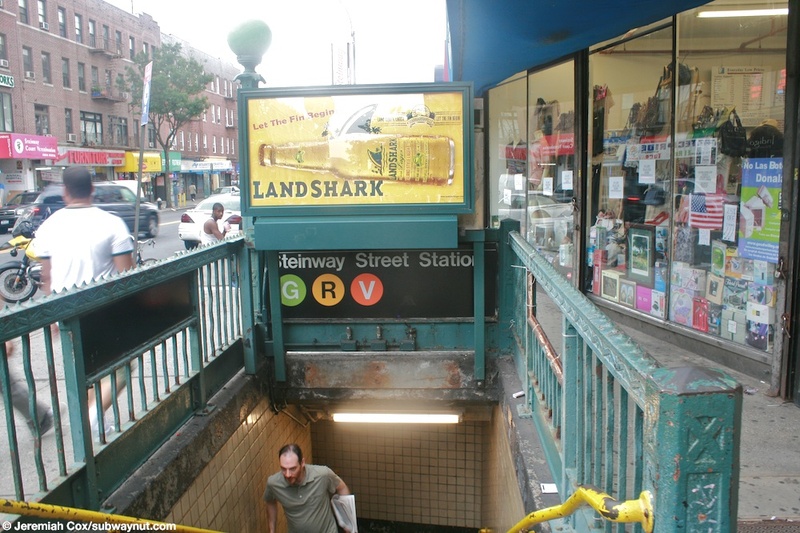 There are High Entrance/Exit Turnstiles towards the staircases down to each platform and the street stairs. 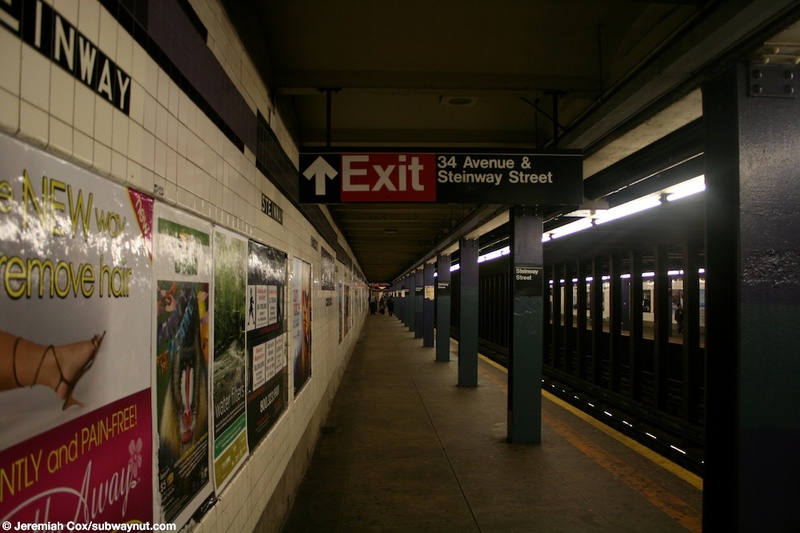 This exit has two street stairs, at the NE and SW corners of Steinway Street & 34 Avenue. The main station entrance is at the extreme northern (Forest Hills) end of the platforms. 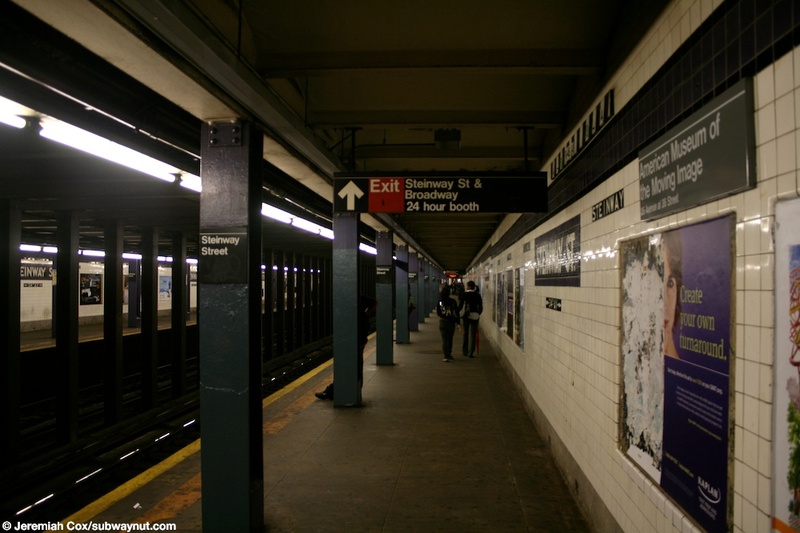 Here a single, wide staircase leads up from the Jamaica-bound platform, and a pair of narrow staircases from the Manhattan-bound one up to a small mezzanine area where there is a small amount of seating before the bank of turnstiles, and the stations token booth and a pair of staircases that lead up to eitherside of Steinway Street, (the one to the east side is a bit farther down than the one up to the west side), just beyond mid-way down the block towards Broadway. 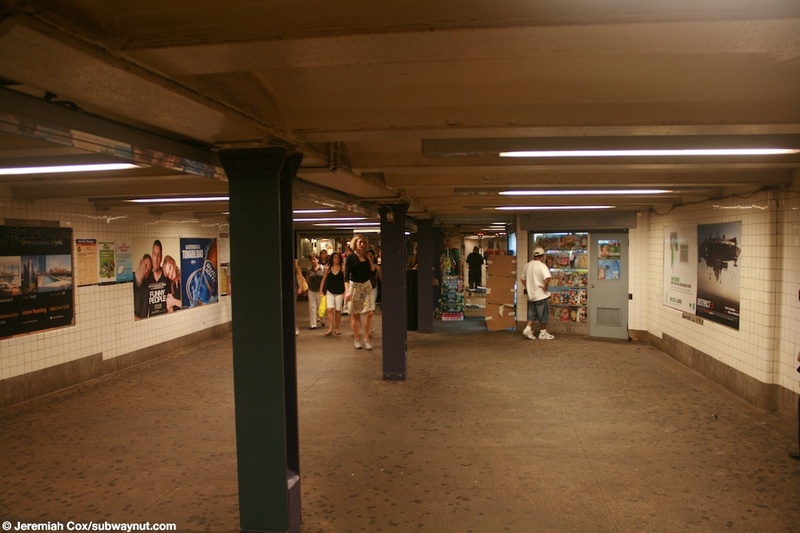 Outside of fare control there is a newsstand on this entrance level. 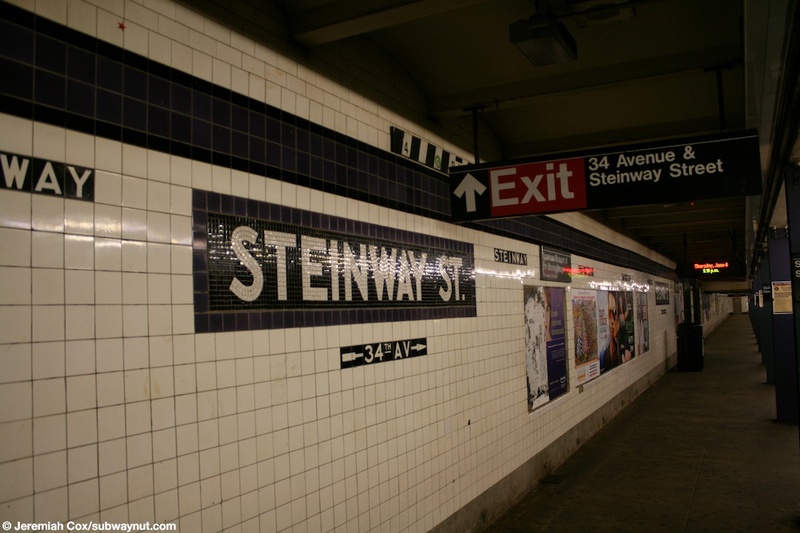 This exit is signed as for Broadway & Steinway Street, and just beyond the station's platforms the tracks curve to continue east and fallow Broadway. For decorations the stop has a purple trim line with a narrow black boarder. Beneath it are Steinway tiles. The name tablets have a purple boarder, and black tiles beneath their white letters. There are I-beam columns that are painted purple along the platforms at regular intervals. 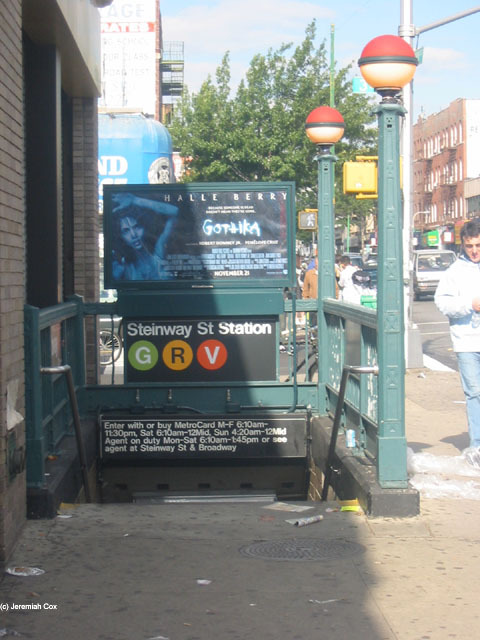 5 October, 2003 (steinwayr2) Looking down one of the two street stairs at 34 Avenue to Steinway Street, the entrances hours are extremely complicated, sometimes the token booth is open while othertimes the entrance its open with TVMs and High Entrance Turnstiles. Overnight the entrance is closed, far too confusing if you ask me. 5 October, 2003 (steinwayr3) Steinway tiling beneath the trim line on one of the platforms. 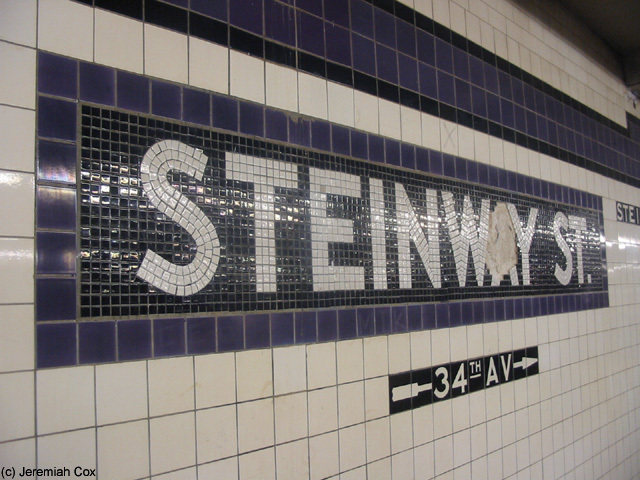 29 February, 2004 (steinwayr4) A Steinway St name tablet, its missing some of its small mosaic tiling. 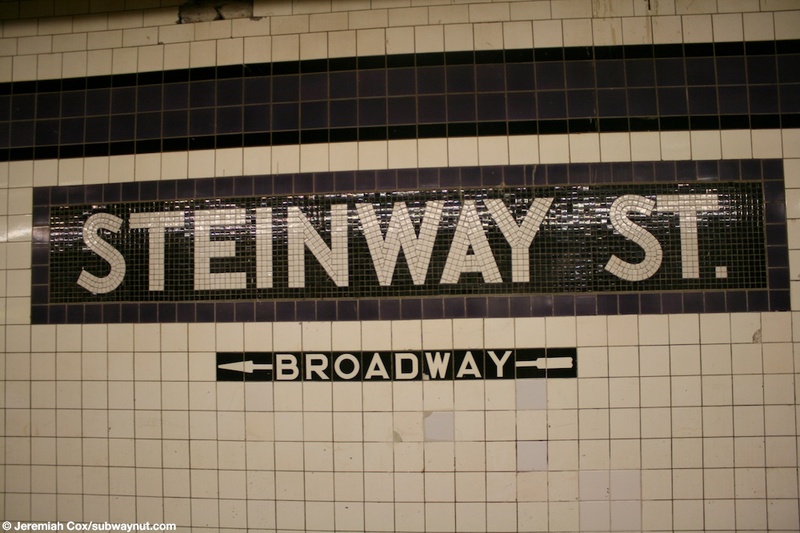 (steinwayr5) Another Steinway St name tablet, this one is in good shape and has an exit arrow beneath it for Broadway. 4 June, 2009 (steinwayr6) Another close up of the simple Steinway tiling beneath the platform walls purple trim. 4 June, 2009 (steinwayr7) Looking down the long and simple Forest Hills-bound side platform at Steinway Street. 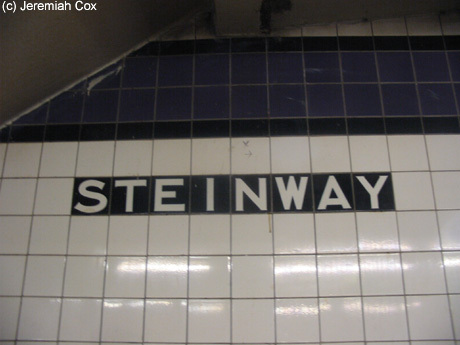 4 June, 2009 (steinwayr8) A Steinway St name tablet, exit arrow tiling beneath it, and the sign that hangs off the cieling for 34 Avenue & Steinway Street. The Zebra Stripes conductor's stop board for 4 car G trains is also visible. 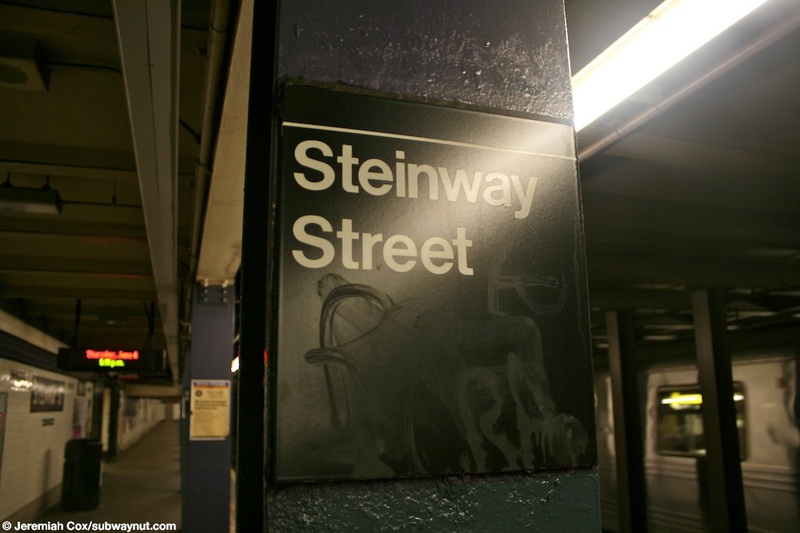 (steinwayr9) A Steinway Street column sign. 4 June, 2009 (steinwayr10) Looking up a short staircase of three stairs on the mezzanine level at Steinway Street. 4 June, 2009 (steinwayr11) Looking down the Manhattan-bound side platform at Steinway Street. 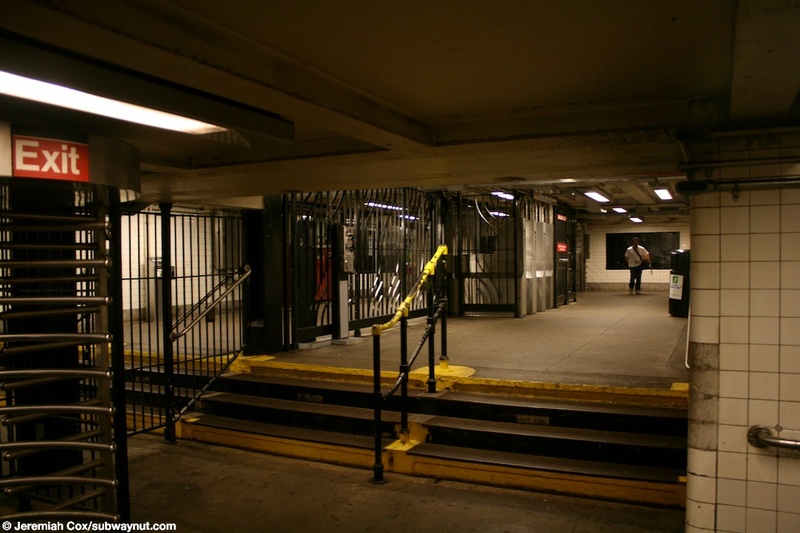 4 June, 2009 (steinwayr12) Passengers in front of the one staircase up from the Forest Hills-bound side platform to the exit to 34 Avenue at Steinway Street. 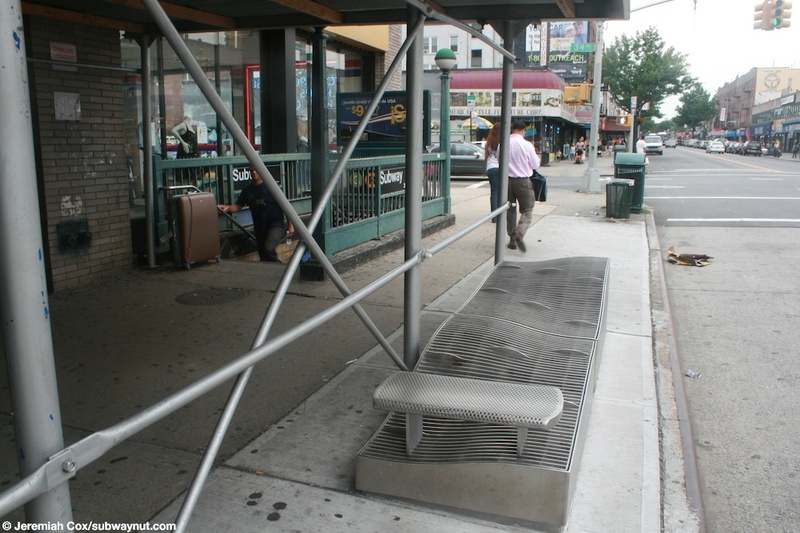 (steinwayr13) One of the modern flood-safe raised grates along the sidewalk at Steinway Street with a street stair visible. 28 July, 2009 (steinwayr14) An entrance staircase at Steinway Street towards the Broadway end of the staircase. 28 July, 2009 (steinwayr15) The mezzanine area beneath Steinway Street outside of fare control, the statoin's newsstand is visible. 28 July, 2009 (steinwayr16) The split of the two staircases at the full-time end at Steinway Street, this view clearly shows how offset the exit staircases are.